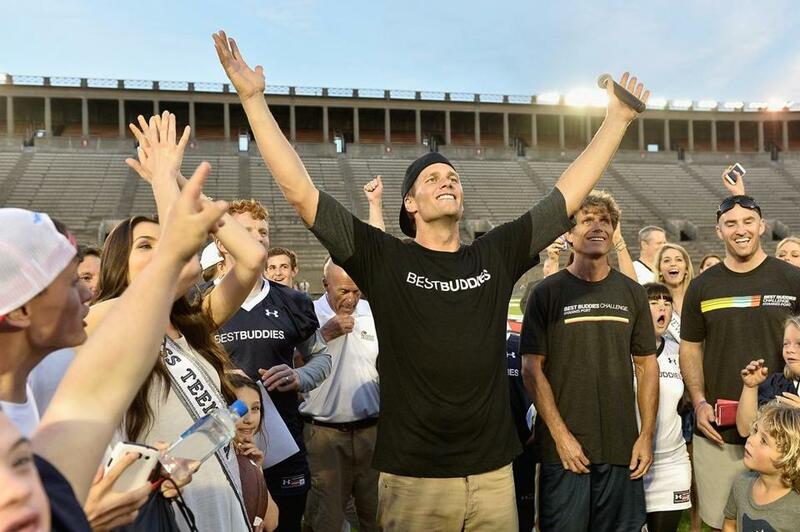 Tom Brady’s relationship with Best Buddies has changed in recent years. The organization has become a major source of funding for Brady’s own charitable goals. The legend of Tom Brady has grown thanks to charming images of his celebrated appearances for Best Buddies International, a nonprofit dedicated to helping intellectually and developmentally disabled people. Smiling children, adoring spectators, and a beaming Brady embracing those with disabilities: No other undertaking in his 17 years in Boston has more vividly portrayed the New England Patriots star as a fabulously wealthy sports figure committed to charity. Yet Brady’s relationship with Best Buddies has changed in recent years. The organization has become a major source of funding for Brady’s own charitable goals. Since 2011, while Brady has served as the face of its signature Massachusetts fund-raiser and helped it raise nearly $20 million, Best Buddies has paid $2.75 million to Brady’s own charitable trust and has pledged to grant the organization an additional $500,000 in 2017 — a total of $3.25 million. The payments, made at Brady’s request, support his Boston-based Change the World Foundation Trust, whose giving has focused almost entirely on causes tied to Brady’s personal interests, including his high school alma mater, his children’s private schools, and charities operated by his football friends. Aiding those with disabilities, the focus of Best Buddies, has been a lower priority. Independent charity monitors said there appears to be nothing illegal about the arrangement — charities can and do donate to other charities. But they questioned why someone of Brady’s wealth has taken large sums for his foundation from another charity that has its own priorities and needs. The donations from Best Buddies have been by far the Brady organization’s largest source of funds. Charitable giving experts also expressed concern that Best Buddies and Brady have given the public and other Best Buddies donors and participants only limited information about the financial arrangement, and they wondered if Best Buddies should properly report the annual payments as fund-raising expenses rather than charitable gifts. The arrangement was forged by Brady and his friend, Anthony K. Shriver, the founder and chairman of Best Buddies, a public charity that solicits money nationwide. 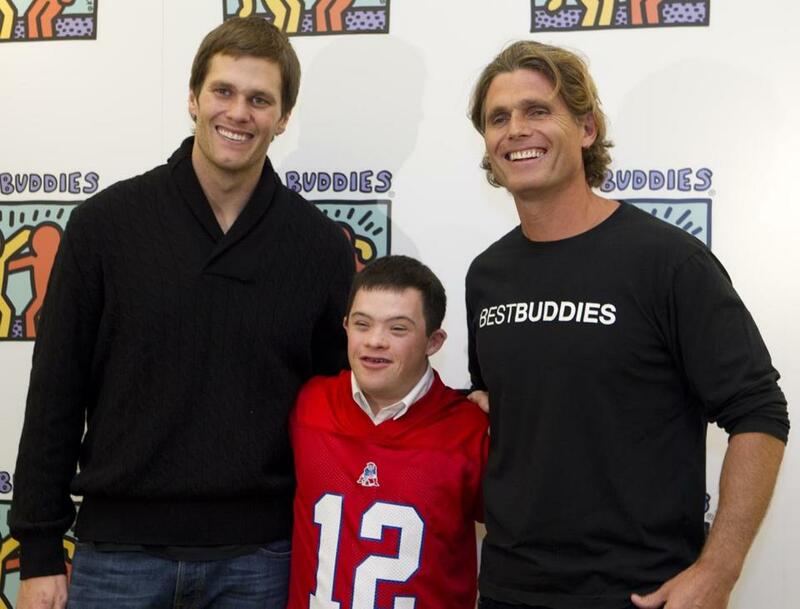 Tom Brady (left) and Anthony K. Shriver (right), with Chris Harrington, at a Best Buddies event in Boston. Shriver said in an interview that Brady had volunteered his time and image to Best Buddies for many years before he told Shriver he was becoming very busy and wanted to focus on his own charitable foundation. Shriver said they agreed Best Buddies would grant Brady’s charitable trust $250,000 in 2011. Every year since, they have decided the figure would be $500,000, and Shriver said he expects Best Buddies to continue giving $500,000 annually to Brady’s trust. They have no contract. Shriver said Brady was not available to comment. Shortly after inquiries from the Globe earlier this month, Best Buddies issued a news release crediting Brady with helping to raise $46.5 million since he began supporting the organization as a volunteer in 2001. Shriver, a nephew of President John F. Kennedy, founded Best Buddies in 1989 to advance a cause that his mother, Eunice Kennedy Shriver, the slain president’s sister, began to champion in the 1960s. Many luminaries have supported Best Buddies through the years, among them current “celebrity ambassadors’’ who include Brady, Sugar Ray Leonard, Kyrie Irving, Carl Lewis, Ron Howard, Rob Lowe, Emmitt Smith, and Cindy Crawford. Yet only one celebrity other than Brady has received compensation for his charitable foundation from Best Buddies, Shriver said. The other was Kevin Spacey, whose personal charity received a one-time grant of $200,000 in 2015. Charity watchdogs said it is not unusual for nonprofits to pay celebrities to help raise money, and they did not dispute that Best Buddies has realized an enviable return on its relationship with Brady. Shriver credited Brady with raising a sizable portion of the $19.7 million that Best Buddies has garnered from its annual Hyannis Port Challenge since the payments to Brady’s trust began in 2011. But nonprofit watchdogs said the arrangement could diminish Brady’s charitable image. “It’s not all bad, because he is helping an important cause,’’ Borochoff said. “But he could help Best Buddies to a much greater extent if he didn’t take their money’’ for his own charitable trust. Brady launched Change the World in 2005, after he signed his first big deal with the Patriots: a six-year, $60 million contract. He has since amassed personal wealth estimated at $180 million, while the net worth of his wife, Gisele Bundchen, is about $360 million, according to Celebrity Net Worth, a website that tracks such things. Brady, the sole trustee of his private charity, initially funded the nonprofit with a donation of $490,000 in 2005. Since then he has not made a significant financial contribution, according to tax reports through 2015, the most recently available. Instead, Best Buddies has almost entirely funded Brady’s foundation. Through 2015, nearly 98 percent of Change the World’s total contributions of $2.3 million since Brady’s initial donation were $2.25 million in grants from Best Buddies. Including Brady’s donation, the percentage is about 80%. And where did the money go? From 2011 through to 2015, Change the World gave grants of $55,000 to Best Buddies, after donating a total of $80,000 over the previous three years. Otherwise, from 2011 through 2015, Change the World distributed nearly $1 million to more than 30 nonprofits. The largest beneficiary was Brady’s alma mater, Junipero Serra High School, in San Mateo, Calif., at $250,000. The next largest grants, $100,000 each, went to Santa Monica Catholic Community, where Brady and Gisele Bundchen were married in 2009, and the TB12 Foundation, a charity Brady formed in 2015 to support clients of his Foxborough-based TB12 fitness and nutrition company. Ohio State University received a $50,000 donation in honor of Ed Razek, a former Victoria’s Secret executive who is said to have helped launch Brady’s romance with Bundchen by setting them up in 2006. Others getting $50,000 were Brady’s college alma mater, the University of Michigan, for cancer research; as well as Dana-Farber Cancer Center, Mission of Hope Haiti, and the Navy SEAL Foundation. A charity honoring Tom Martinez, Brady’s longtime personal coach who died in 2012, received $37,800. And $30,000 went to a nursing facility in Minnesota that cared for Brady’s grandfather before he died in 2016. In addition, Change the World donated $10,000 to Saint David’s School in New York City and $20,000 to the Apple Orchard School in Brookline, both of which Brady’s children have attended. Nonprofits created by Brady’s former teammates also benefited, with grants of $25,000 going to Vince Wilfork’s charity, $10,000 to Deion Branch’s, and $5,000 to Wes Welker’s. The entire arrangement has stirred concerns among some nonprofit watchdogs. Marc Pollick, who for 20 years has advised charity-minded celebrities through his Giving Back Fund, began consulting last year for the NFL Players Association. Because Brady is an NFLPA member, Pollick would not comment directly on the quarterback or Best Buddies. But he said he would counsel any celebrity against participating in such an arrangement. Best Buddies has spent more than $200 million developing a volunteer network aimed at ending the social, physical, and economic isolation often experienced by those living with disabilities. Volunteers help them form friendships with peers, find jobs, and live independently. Shriver said he was not concerned that Brady’s trust has dedicated relatively little of its Best Buddies money to Shriver’s cause. Change the World ended 2015 with net assets of $1.7 million. Nonprofit watchdogs said the public would be better served if their financial relationship were clearly disclosed. There is no mention of the arrangement in Best Buddies promotional material. Best Buddies did recently describe the payment arrangment with Brady in a press release. Before that, a prospective donor, short of directly asking Best Buddies about the connection, would have needed to visit the charity’s website, download its tax return, and scroll through dozens of pages to find listed a $500,000 grant to the Change the World Foundation. Even then, there is no mention of Brady. And Googling “Change the World Foundation’’ does not readily reveal a connection to Brady. By further searching Change the World’s state or federal filings, a prospective donor could discover that the nonprofit’s trustee is Thomas E. Brady Jr.
Borochoff said charities are not required to publicize their compensation to celebrities, although failing to do so may not reflect the highest standards of philanthropy. “Sometimes the compensation is hard to find, and a celebrity gets credit for caring about something when the reason he actually cares about it is because he or his foundation is getting paid,’’ Borochoff said. Shriver said he and Brady agreed that fully disclosing the arrangement might prove distracting, especially during the Hyannis Port Challenge. This year’s sold-out event, whose highlight is a 100-mile fund-raising bike ride from Boston to Hyannis Port, is scheduled for the first weekend in June. “We decided it was really best to make the weekend all about Best Buddies and not confuse the message,’’ Shriver said. The Hyannis Port event typically kicks off on Friday with Brady hosting a celebrity football game at Harvard Stadium. On Saturday, Brady and Shriver host a VIP lunch for donors at the home of President Kennedy’s parents at the family’s Hyannis Port compound. Brady then takes short tandem rides with participating cyclists, helps distribute awards during a lobster and clam bake, and attends a VIP reception at Shriver’s home in the Kennedy compound. Supporters who commit to raising $50,000 receive a spot on Brady’s team at Harvard Stadium, two photos with him, five VIP tickets to the weekend events, and an official football and jersey, each autographed by the five-time Super Bowl champion. Best Buddies gets generally high marks from consumer groups, including three of four stars from Charity Navigator, an organization that says it provides prospective donors with unbiased evaluations of nonprofits they may wish to support. But several nonprofit monitors said Best Buddies appears to be falling short by not reporting the payments to Brady’s foundation on its state and federal tax documents as fund-raising expenses. Shriver disagreed, asserting that the Change the World grants are appropriate honorariums because Brady provides Best Buddies much more than fund-raising services. “He’s a global ambassador for the movement,’’ Shriver said. Shriver said Brady appears at Best Buddies events across the country. Next year, his duties will include attending the Masters golf tournament for a venture involving Best Buddies and one of its sponsors, Chevron. Shriver asserted that wealthy public figures such as Brady are sometimes unfairly criticized for the charitable and fund-raising practices. He cited members of the Kennedy family who have been chided for raising election funds despite their personal fortunes.